The kids are out of school. They are driving me nuts. I am definitely a better mother when they are in school. The constant outside then inside process that repeats 800 times a day drives me bonkers. I know that the bi-polar makes my moods switch pretty quickly, but since being on the Lamictal I haven’t hadany problems. Oh gosh with them home; it’s like I’m not on any medicine! They wander around like they have absolutely nothing in the whole wide world to do. They act like there’s nothing to do outside, and they have nothing to do inside. I mean for pete’s sake. AND they eat like there is no tomorrow! I don’t know how they survived at school considering these two can’t do anything but wonder what is for dinner, or when it’s snack time. I’ve put them on a schedule and the first person who asks me when they can have a snack has to clean something. My daughter used the Magic Eraser on the walls today. I think they thought I was kidding. Oh have mercy on me. I hope I make it through the summer. I hope my husband doesn’t lock me up in a mental ward before the summer is over because I’m driving him nuts due to how cranky the kids are making me during the day!!! And because I’m so cranky and annoyed I just can’t stop eating. I seem to be hooked on peanut butter this week. Can’t seem to get enough. I’ve had 3 peanut butter and jelly sandwiches today. Yes; you read right! 3! The kids have thrown off my routine! And I have to skip therapy this month. Oh gosh. 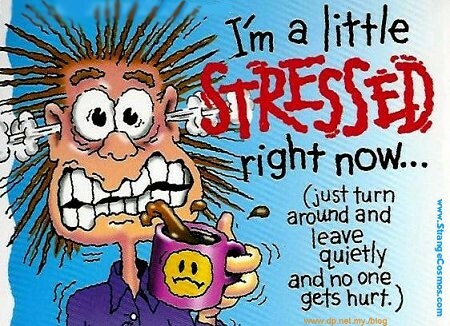 STRESS!!!! Send help.